The quality and quantity of available fresh water has been greatly affected by unsustainable development and governance failures, says the UN World Development Report launched in New Delhi last week. Titled “Water for a Sustainable World”, the report presents an exhaustive account of the state of the world’s water resources. “Water resources are a key element in policies to combat poverty, but are sometimes themselves threatened by development. Water directly influences our future, so we need to change the way we assess, manage and use this resource in the face of ever-rising demand and the over exploitation of our groundwater reserves,” said UNESCO Director-General Irina Bokova in an official statement. Describing the linkages between water and critical areas such as human health, food and energy security, urbanisation, industrial growth and climate change, the report highlights the role of water and sanitation in the post-2015 development agenda. By 2015, the millennium development goals (MDG) will come to term and the new sustainable development goals (SDG) will come to light. It says that until a balance is established between demand for and supply of water, people will continue to face water crisis. 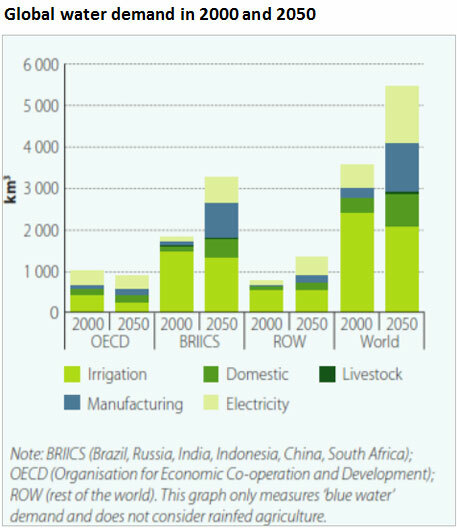 There has been increasing demand of water due to urbanisation, food and agriculture, energy, industrialisation, ever-increasing production and consumption and climate variability and change. The report says that lack of sanitation and hygiene can have a huge impact on the health and economic growth of the country. There has been an unwillingness of the local and national governments to provide water and sanitation to increasing slum population. 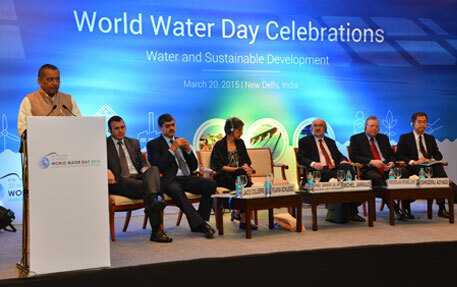 However, the challenges of water and of sustainable development are different in different regions. The report focuses on challenges and comments on the solutions to those challenges. It explains the scenario in Asia and Pacific regions, Arab region, Latin America and Caribbean region and Africa. 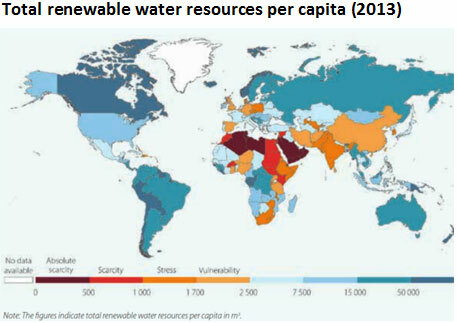 The figure (below) shows India in the vulnerable category as far as total renewable water resources is concerned. While describing the Asian region, the report says that Bangladesh, China, India, Nepal and Pakistan together account for nearly half of the world’s total groundwater use. There has been a huge increase in the extraction of groundwater, by 19 times in just 40 years. The report was launched in Delhi by Union Minister of State for Water Resources, River Development and Ganga Rejuvenation, Sanwar Lal Jat. The country is facing tough challenges in managing water resources, agreed the minister. “The National Water Policy adopts an integrated approach to water management which is vital for poverty reduction, environmental sustenance and sustainable economic development,” he said. 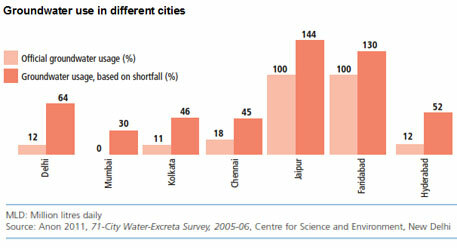 Both surface water and groundwater are under stress in India. 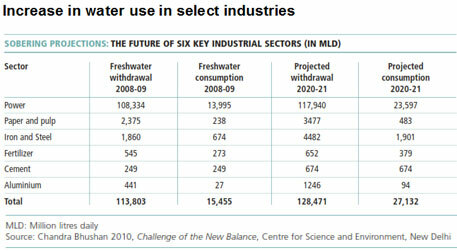 Delhi-based non-profit Centre for Science and Environment (CSE)’s study on urban water shows that water consumption of the industrial sector will double from 2008-09 and 2020-21 (see table below). Since planners are obsessed with water and not its supply, cities source water from distant places. Water is lost in distribution and there is inequity in supply of water to the people. Cities are not able to recover the supply cost from the citizens and have no money to invest in sewage. Groundwater is not recognised as a critical source of water supply and recharge is not considered important. Big recharge bodies in cities are not protected or conserved. It is expected that this report will act as a guideline for good governance and for bringing about a balance between fresh water resources and sustainable growth. Water is Elixir of Life - Leonardo da Vinci.